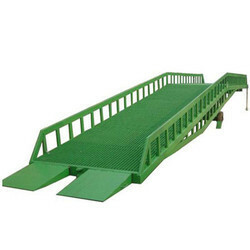 We manufacture and supply Dock Ramp. Maglec Handling Equipments Pvt. Ltd.
We are the Manufacturers and suppliers of high quality of Mobile Dock Leveler. We are successfully ranged amongst the foremost organization for offering Dock Leveler. Our dock leveler consists of hydraulic operated dock and lip that enables efficient lifting operations. This dock leveler is manufactured by using high grade basic material and sophisticated technology by our proficient professionals.